The Pro's Guide To Pre-Workout Nutrition! Don't overcomplicate your pre-workout nutrition! Utilize this simple-but-effective advice, and start making better progress in the gym. Great workouts don't happen just because you're a great athlete; even the pros have off days. The key to avoiding those off days is to prepare for your workouts before you even set foot in the gym! This means eating the proper foods in the hours before you train, taking supplements that help you maximize your productivity during training and ensure post-training recovery, and getting mentally ready to lift with intensity. 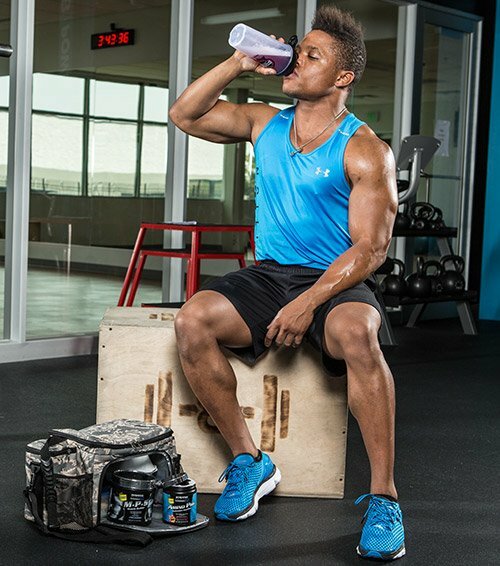 To help you make smart pre-workout nutrition and supplementation choices, we've asked a batch of elite, sharp athletes from Dymatize Nutrition to detail their pre-workout plans. Implement some of their choices into your routine, and see how they impact your workouts. If you notice more energy and bigger lifts, you know you're doing something right! Regardless of whether your primary goal is performance- or physique-based, you're unlikely to have a great workout unless you've ingested the proper fuel before you train. Without any calories in your body, you just won't have the energy to train with intensity. Cancer survivor and amateur bodybuilder Robert Timms always prioritizes pre-workout nutrition. "I try to ensure that I get everything I need in for the job, just like having my tools for work," he says. 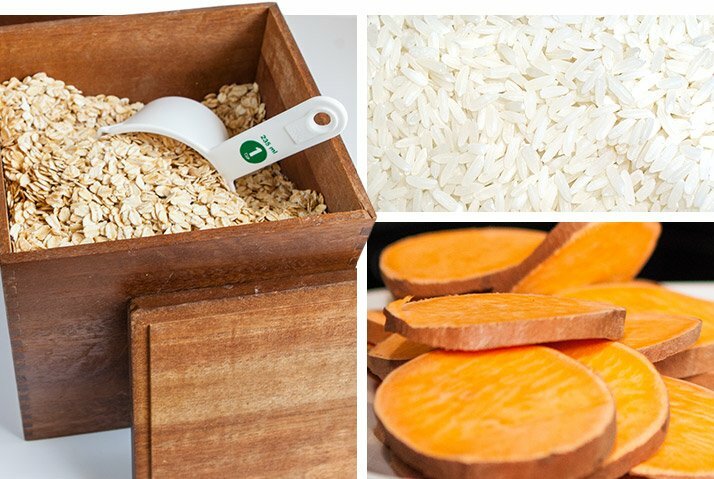 Timms's "tools" are carbohydrates and protein. "Before I train, I take in some type of simple carbohydrate in order to give me energy. I also make sure I have a whey isolate protein shake because it can be digested at a quicker rate [than food]," Timms says. "It's a really simple concept, but it works well for me!" But Don't Eat Too Much! Protein and carbohydrates are excellent pre-workout choices, but keep in mind that your pre-workout meal should be based on what you know makes you feel good. Actress Alicia Ziegler—aka "Ziggy"— trains first thing in the morning, so she skips a big meal. "I don't like to eat heavy before training, because the food just sits in my stomach," she says. "Because I hit the gym so early in the morning, I can't afford side aches or gut disruption while food is digesting. I also do a lot of high-intensity interval training (HIIT). HIIT on a full belly would just make me sick!" Protein and carbohydrates are excellent pre-workout choices, but keep in mind that your pre-workout meal should be based on what you know makes you feel good. If you eat a large meal before you train, have it about 1-2 hours before you work out. That will provide enough time for digestion, so you don't have to worry about cramps or discomfort. As a general rule, the closer you are to training, the less fiber you want to take in. Experiment with different foods and timing to find an ideal combination that works for you. Ziggy says she likes to have caffeine before her workouts, to enhance her energy and endurance. "My pre-workout is a large, black, iced coffee with a scoop of Dymatize ISO-100 Whey Birthday Cake. This combination gives me a caffeine boost and is an easy way to start the day!" Most pre-workout products include somewhere between 150-400 milligrams of caffeine per serving. If you don't know your caffeine tolerance, make sure you follow the directions on the container, and start with the minimal dosage. Once you know how the caffeine will affect you, you can then start to increase the dosage. Whey Protein Powder for Building Muscle! Go Now! Carbohydrates are the key nutrients that provide your body with optimal energy for performance. So, even if you're going low-carb, putting some carbs into your pre-workout meal will provide you with fuel for a good workout. "For optimal gains and results, I generally consume a fast-digesting carb and protein pre- and post-workout," says Elspeth Dana, personal trainer and fitness model. "One of my go-to meals, both pre- and post-workout, is white rice and protein powder. I like having white rice because it's fast-digesting, so I have energy right when I need it. I try to consume this meal 30-60 minutes before my workout," she says. Be sure to pay attention to the timing of your carbohydrate intake. Consuming a fast-digesting carbohydrate such as white rice too long before training will leave you feeling sluggish for your workout. Carbohydrates are the key nutrients that provide your body with optimal energy for performance. So, even if you're going low-carb, putting some carbs into your pre-workout meal will provide you with fuel for a good workout. National-level bodybuilder Geremy Satcher, on the other hand, prefers sweet potato or oats before his workouts. "My body does not function well without carbohydrates. Therefore, I eat a surplus about 30-45 minutes before I train," he says. "That surplus serves as protection for my muscle mass by providing an efficient fuel source. "I train with a lot of volume and intensity. I've found that eating oats or sweet potato before I work out gives me enough energy to train at my highest abilities," says Satcher. "I keep things plain and simple, and it seems to work well for me." If you choose a high-fiber option such as oatmeal, eat at least 45-60 minutes before you train. High-fiber foods digest slowly and can sometimes cause bloating and gas during your workout. If you like to wake up and get your cardio on, don't forget your branched-chain amino acids! A BCAA supplement provides an immediate fuel source for your muscle tissue, because BCAAs are absorbed directly into the bloodstream and transported to the muscles. For those early-morning cardio sessions, NPC bikini competitor and full-time mom Charlotte Oldbury protects her muscle mass by sipping BCAAs before and during her fasted cardio sessions. "BCAAs before, during, and after a session can help minimize muscle breakdown," she says. If you don't like to do fasted cardio, BCAAs are still a great supplement to add to your pre-workout nutrition plan. Leucine, one of the three essential amino acids that make up BCAAs, is an essential part of the muscle-building process and may help you build more muscle. Your pre-workout nutrition plan doesn't have to be complicated. To ensure that you're making the right food and supplement choices, you need to check in with yourself before and after every workout. "Get to know your body and how it reacts to various carbohydrates and proteins," says Satcher. "What does your body do? How do you feel? How are your gym experiences? What could you do to make them better?" Asking yourself these questions will help you decide what you need to eat before you train. If you're feeling lethargic throughout your workout, then maybe you need to add some extra carbohydrates or caffeine to that pre-workout meal. If, on the other hand, you keep having stomach problems, you may be eating too much, or eating too soon before you train. Your pre-workout nutrition needs to be personalized. "What works for me may not work for you," advises Satcher. So pay attention to what you're putting into your body and how it may be affecting your workout. Once you figure out the best strategy, you'll immediately start seeing better results! Goldstein, E. R., Ziegenfuss, T., Kalman, D., Kreider, R., Campbell, B., Wilborn, C., and Antonio, J. (2010). International society of sports nutrition position stand: caffeine and performance. Journal of the International Society of Sports Nutrition, 7(27), 71-15. Matsumoto, K., Koba, T., Hamada, K., Sakurai, M., Higuchi, T., and Miyata, H. (2009). Branched-chain amino acid supplementation attenuates muscle soreness, muscle damage and inflammation during an intensive training program. Journal of Sports Medicine and Physical Fitness, 49(4), 424-31.